A block of flats that I visit quite often in Arcadia. I actually visit a lot of places in Pretoria even though I am a resident. Just last week, I stayed in Pretoria East, Six Fountains Residential Estate, and earlier in January I stayed in Pretoria West and in December I stayed at Grootfontein Country estate and in Leeuwenhof Estate. Just writing about this is exciting. I love this city, boring, laid back, or whatever the beach trotters call it. Anyway, back to the Arcadian Heights, Pretoria. I think this is a very cute part of Pretoria. Blocks of apartments are smaller and fewer floors. No load shedding, power failure and damaged lift worries. Don’t get me wrong, I use a lift every time I visit my friend, her husband and their cute son. And I fall in love with this block of flats again and again. No specific reason for this love, could be my friend’s mature, elegant and gorgeous Italian furniture and decor. Or the generous volume of their space. Like most families, they have tried house shopping but struggle to get the similar generosity in space in the modern small sized room suburbs. Houses are getting tinier. Not to mention gthe lack of convenience. 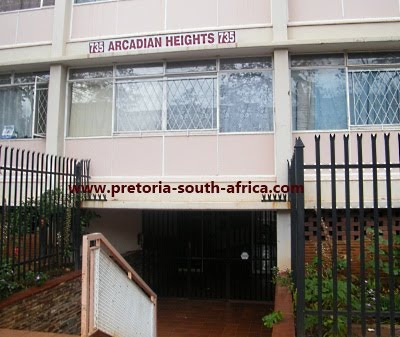 In Pretorius Street, where Arcadian Heights is located, there is Muelmed Private Hospital, Arcadia Primary, a number of crèches and boys and girls High Schools, Arcadia branch of Tshwane University of Technology to the West, a walking distance to the University of Pretoria further East and Loftus Versfeld Stadium next to UP, a number of embassies, just a stone throw away from the Union Buildings, and a lot more amenities and tourist attractions to mention. I ask myself this question so often: Why do we live so fat from all this convenience?